WARNING: This part has to be done the day before you want to serve. Stir together all of the marinade ingredients in a nonreactive bowl. Place the roast in a nonreactive container (or large ziplock bag) and marinate overnight. 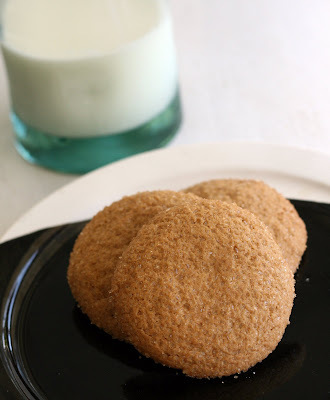 The day before is also a good time to make the gingersnaps if, like me, you are using homemade. The next day: Remove the meat and pour the marinade in the slow cooker. In a large skillet, quickly brown all sides of the meat in the canola oil. Add the meat into the slow cooker and turn on low for 6 hours. During the last hour or so of cooking time: Start to make the dumplings. Bring a large pot of water to a rolling boil. In a large bowl, combine the cooled mashed potatoes and salt and the egg. Stir in the baking powder and add the flour in 1/2 cup increments until the it resembles a dough and the mixture holds its shape when molded (roughly 3 cups). Form into 2 to 4 inch balls. They should be able to hold their shape but not be too floury. Drop them into the water. They should sink, then rise to the surface when cooked through. Set aside. 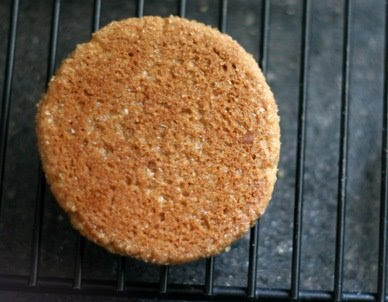 During the last 1/2 hour of cooking time: Skim off any visible fat that may have risen to the top then add the gingersnaps and turn the heat to high. After the time is up, shred the meat a bit with a fork or break it into pieces. Serve hot, with dumplings on the side. Have an Instant Pot? 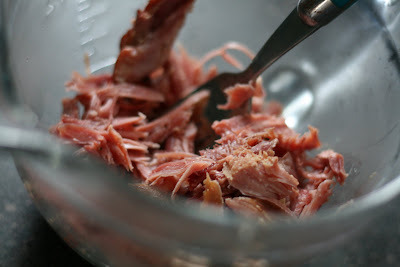 I've created a new recipe that makes sour beef in just over one hour! Check it out here. My grandpop loves sour beef and in turn so do I. Baltimore has strong German roots and some of the old food traditions continue today. As a child my mother and I would sweet talk the ticket takers at the yearly German festival at Carroll Park to let us in (for free) just long enough to pick up a large order from our favorite stand to take home. Now you can buy bottles of Mrs. Minnicks' sauce at the grocery store but freshly made is always best. Until I made this, I had never made sour beef before but after a year of watching beef prices* I finally found a good deal on some meat suitable for cooking for a long time and decided to take the plunge. I bought the traditional beef roast but cut it into large (roughly 2 inch wide) chunks/thick slices so the marinade would penetrate better and more quickly. In deference to the extremely hot weather we are having, I used the slow cooker but you could also follow the same instructions but use a dutch oven and roast it for about 4 hours at 350 or until thoroughly cooked and fork tender. While I only marinated the meat overnight (or more accurately, about 20 hours) you can marinate it up to 3 days if you would rather use the whole roast. Also, some people add juniper berries to their sour beef but I sort of think I am allergic to them so I left them out. 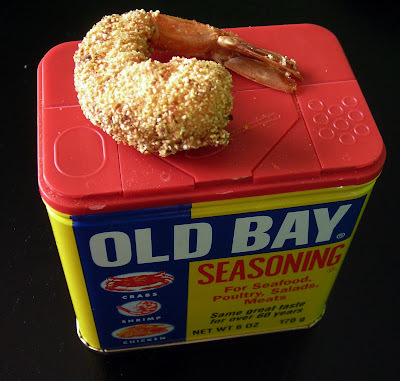 I also don't think they are entirely necessary, flavor-wise, at least not for the kind of sour beef we eat here in Charm City. *I just can't bring myself to pay $13 (or more!) per pound for meat that is going to cook for hours. When did cheap cuts of meat get so expensive? Doesn't anyone make stew anymore? Thoroughly drain the tomatoes, reserving juice. 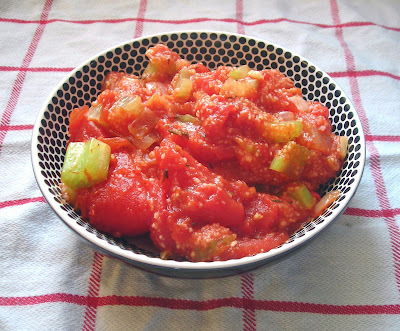 Cut the tomatoes into manageable bites and set aside. Pour the juice into measuring cup and add water until it equals 2 1/4 cups*. In a medium pot, bring the tomato juice to a boil. Add the grits and stir continually for about 10 minutes or until all the liquid is absorbed and the grits are soft. Remove from the heat. Keep covered until ready to serve. Meanwhile, heat the olive oil in a medium skillet then add the garlic, onion and celery. Saute until softened, then add the tomatoes and spices. Cook 2 additional minutes or until the whole mixture is hot. Stir the mixture into hot grits and serve. *I had to add less than 1/4 cup of water. Matt fried up some catfish for dinner and I made this as the side dish. I love to combine the starch with the vegetables, it is much simpler than making a bunch of side dishes, especially for just the two of us. Red rice has long been a favorite around here, and I got to thinking that grits would work just as well as rice. The texture is different, but the grits really absorbed the juice and had a great, fresh tomato flavor that was accented by the celery and thyme. Still waiting for tomatoes to really come in season, but this helps hold me over. Mash the beans, chipotle and the potato together until fairly uniform in texture but not to the point of paste. Gently stir in remaining ingredients. Add more cornmeal if the mixture is too wet to form into patties. Form in to uniform, fairly flat patties. Place on a oiled piece of foil, brush the tops with oil and cook on the hottest part of the grill, flipping once halfway through cooking. It should take about 10-20 minutes. *I love the freeze dried chives by Smith & Truslow. They have a great, fresh flavor and I don't have to bother keeping fresh chives on hand all the time. No grill? Preheat oven to 375. Lightly oil a baking sheet and bake 20 minutes, flipping once halfway through the cooking time, or until crisp. Alternately, pan fry. 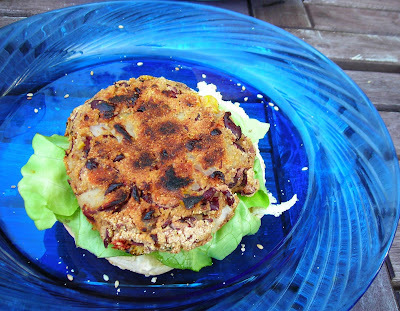 When I first suggested the possibility of grilling a meatless burger to my husband he was skeptical. But after eating it, he was a total convert. These, despite being virtually fat-free, are really flavorful. I used potato as a binder and loaded them with ingredients we love: fire roasted corn, chipotle, garlic, onions, lime. 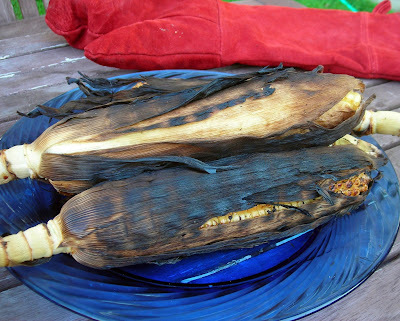 Instead using flour, rice or quinoa as filler I used cornmeal to accentuate the flavor of the corn. The corn, onions and partially mashed beans add a lot of texture interest and pockets of flavor which set them apart from some of the mushy, bland veggie and bean burgers I've had in the past. They also cooked very evenly-crisp all over with no mushy, damp center! 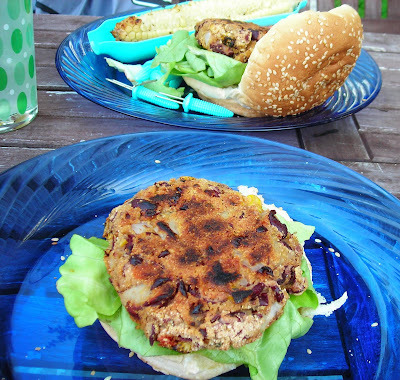 While the burgers do hold their shape well, it is best to grill them on foil as they are not as uniformly flat as commercially made burgers and it is a little tricky to slide the spatula under the burgers when they are on an uneven surface. 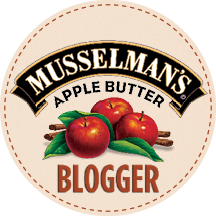 The foil supports them just enough to provide a smooth surface for the spatula and is easy to oil to avoid sticking. First, remove the stems from the greens and tear them into small pieces. Rinse thoroughly. I suggest rinsing then running them through a salad spinner because they are often quite sandy. In a large (at least 8 quart) pot, heat the oil. Saute the onions, garlic, peppers, thyme and bay leaves until just golden, about 10 minutes. Add the broth, turkey legs, salt, pepper and sugar. Bring to a boil, skimming off anything that rises to the surface. Reduce heat and simmer 1 hour. Remove the turkey legs and pick off all of the meat. Reserve the meat, discard the bones. Add the greens, return to a boil. Stir so all of the greens are coated in broth and starting to wilt. Reduce heat and simmer about 30 minutes, adding the turkey back in during the last 5 minutes of cooking time. Serve hot with crusty bread for sopping up the juices. Matt made these for dinner early this month and they were so good, he made them again! 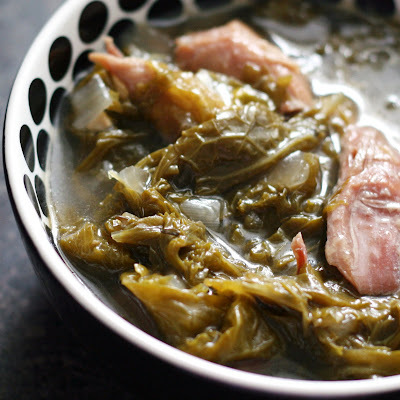 A little different than the typical collards, we use mustard greens (less bitter/grainy) and meaty smoked turkey legs (instead of the more typical ham hocks) for a really delicious side dish. It is so good and even holds up well for leftovers the next day. Just make sure you don't forget to sop up (or just straight up drink!) the the pot likker, the tasty juice that leeches from the greens. In my opinion, that is the best part. Make the rice according to package instructions but adding a couple drops of sesame oil and some sesame seeds to the water. This time I used the liquid leftover from rehydrating the mushrooms for the omelet for a little extra flavor instead of water. Cover dried mushrooms with hot water for 20 minutes, then squeeze the liquid out and cut into thin strips. 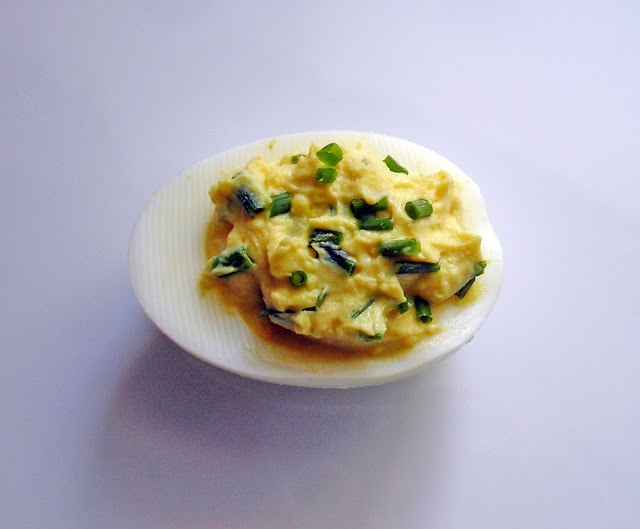 In a small bowl, beat eggs with the sesame oil and the green onions. Cook like an omelet in a large hot skillet, tilting to spread the egg mixture across the surface of the pan, about 2 minutes. When the top of the omelet is almost set, flip the omelet and cook for 1 minute on the other side. Remove to a plate and roll the omelet into a tight coil then slice it into thin, even strips. It should then uncoil, leaving you with long strips of egg. Heat the oil in a wok. Stir fry the garlic then add the Chinese broccoli. Stir fry until the greens are starting to wilt, then stir in the soy sauce and oyster sauce. Meanwhile: Fry the bacon in a large skillet. Drain onto paper towel-lined plates then cut into small pieces. Set aside. 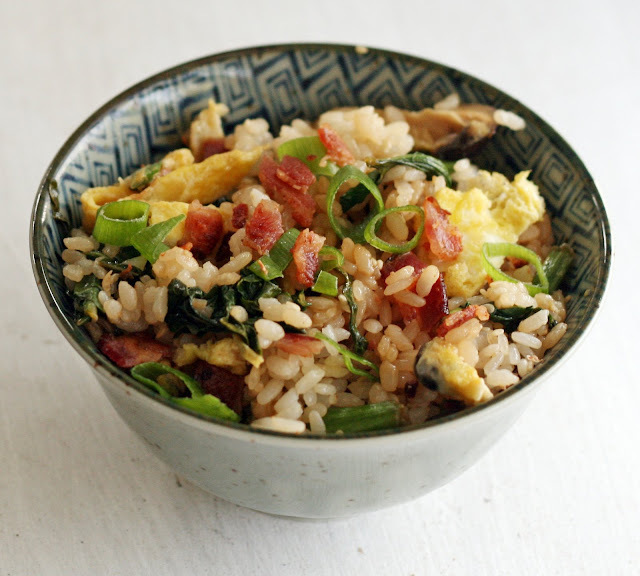 To serve: toss the cooked rice, bacon, Chinese broccoli and omelet together. Drizzle with soy sauce. Sprinkle with green onion. EAT! *I like Koshi rice which is really tasty Japanese variety called Koshihikari grown here in the US, but any good quality sushi rice will do. This recipe grew out of Matt's memory of an high school friend mentioning that she would eat bacon rice for breakfast. At the time he thought it was odd but once he told me about it, we realized that it actually sounded kind of good. We weren't entirely sure what was in it so we came up with this, a sort of pan-Asian un-fried rice. The very few mentions of bacon rice I could found after we made if for the first time were mostly for Japanese American homestyle bacon fried rice or of visits to "bacsilog" -bacon, egg & garlic fried rice- stalls in the Philippines. Frankly, I am not sure if fried rice is quite what I want to start my day off with. My version is slightly more dressed up and I bet, a bit fresher tasting. Despite the bacon, this recipe yields a decidedly non greasy meal, especially if you use thick, center cut bacon which generally is high in flavor but lower in fat and then thoroughly drain the slices. Another pro in the un-fried column is that despite our 3x+ a week consumption of sushi rice, I almost never have leftover rice. Making the rice the day I actually want to eat it, rather than having to think ahead and make it the day before so I can make fried rice, is much easier and by the time the rice is done, all of the other components should be ready. While we eat this more often than I'd care to admit, I never thought I'd post the recipe. Bacon rice what we make when I am too tired to come up with something new and/or am tired of photographing everything that comes out of the kitchen. It's made up entirely of ingredients we pretty much always have on hand and is really quick to put together. Despite its undisputed deliciousness, I wasn't sure if anyone would be interested in an actual recipe. I changed my mind after mentioning making it a couple times on Twitter and I was overwhelmed with recipe requests. I guess I shouldn't have been surprised, bacon is always a hit! So here it is. Written out it looks a little complicated but it really just a bunch of little steps that can pretty much be completed at the same time for a meal that takes approximately 30 minutes to make. We like to have it as a weeknight dinner or for a weekend breakfast/brunch before heading out to a busy day. Consider yourself forwarded, once you make it for the first time you will want to make it again and again. I like to make it with some vegetables because it makes the dish into more of a complete meal but if you are in a hurry or want to serve this for breakfast (and are vegetable adverse in the AM) you can leave them out. You can also vary the vegetables. I love Chinese broccoli so I used that but it is also tasty made with other leafy greens like baby bok choy, Shanghai cabbage. tatsoi or even spinach, prepared in the same way. Other variations: Add some chopped shrimp to the omelet. 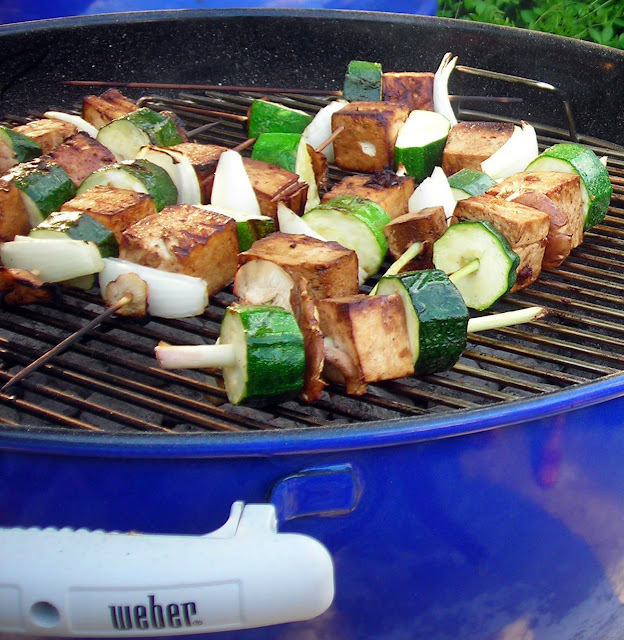 Add some cubed tofu or fresh mushrooms to the vegetable mix. Using the kecap manis (a palm sugar-sweetened soy sauce) will give you a sort of sweet-smoky-salty bacon rice that is an interesting variation on what we typically make. With a gentle hand, mix together all of the burger ingredients. Form into 4 patties. Grill over medium heat about 3-5 minutes on each side. Make sure the burger is cooked all the way through. Raw or "rare" pork is not your friend. 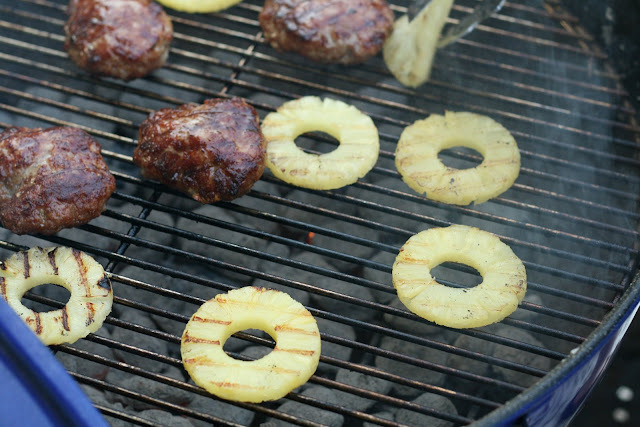 In the last minute of cooking, grill the pineapple slices. Serve on Hawaiian rolls. *You can use fresh, but I ended up using canned pineapple slices (in juice) because I couldn't find a ripe pineapple at the store. They are just as tasty grilled as fresh and are about half the price. Not to mention they are already sliced in the perfect thickness for sandwiches. No grill? Cook in a skillet or broiler. Okay, I've never been to Hawaii, so I am not sure if these are the most authentic burgers in the world, but when I think Hawaiian food I think pork, Spam, pineapple and Asian-influenced. Spam burgers seemed a bit out of the question but pork I could do. I love pork and burgers made from ground pork are exceptionally juicy despite having to be thoroughly cooked. The ginger, garlic, soy sauce and tiny splash of pineapple juice accentuates the pork's natural sweetness while the panko gives them a light quality and keeps them from falling apart on the grill. Stir together the milk, pineapple juice, butter, vanilla, sugar and salt in a saucepan. Bring to a boil then remove from heat and allow the mixture to cool to lukewarm. Meanwhile, in a large bowl, whisk together the flour, ginger and yeast. Pour in the milk mixture and stir until the dough starts to come together, adding more pineapple juice if the mixture looks dry or more flour if the mixture looks wet. If you have a stand mixer, use the dough hook to mix for about 8 minutes. If not, knead the dough on a floured surface for about 10 minutes. Place the dough in a greased bowl. Cover with a towel and wait until it has doubled in size, about 1 hour. Punch down the dough and divide into 6* even portions. Make tight balls out of the dough by pulling the dough towards the bottom and gently stretching until a ball with a smooth top forms. Place seam-side down** on a baking stone or metal baking sheet. I actually just used my silipat and baking sheet. Allow the rolls to sit for a minute. Flatten each dough ball with your hand or the back of a large spatula until it is about 3 to 4 inches wide. Cover the rolls with the towel again and set aside until they have just about doubled in size, about 20 minutes. Meanwhile, preheat the oven to 400. Whisk together the water and yolk to make the egg wash. Brush onto the tops of the rolls. Bake for about 20 minutes or until golden brown on both the top and the bottom and when tapped, they sound hollow. Allow to cool, then slice. *If you want extra large rolls, divide into fourths. The dough, divided in sixths yields rolls big enough to hold a 1/4 lb burger. ** Or seam side up if the seam is fairly smooth and you want the interesting look pictured. I love having King's Hawaiian rolls, especially spread with a little butter, for breakfast. I've always thought it would be fun to make a homemade version but I have never found a recipe that looks right and was having a hard time coming up with a recipe of my own, having only rarely made a sweet yeast bread. Rather than try and make an exact replica, I decided to take the Hawaiian sweet roll concept and create a new recipe, an homage if you will, that was more of a hamburger or sandwich roll than a stand alone roll. The rolls I created aren't quite as sweet as the King's Hawaiian rolls but they are perfect for hamburgers and sandwiches. They add just a touch of sweetness and flavor without overpowering the flavors of the sandwich within and have a great, light texture without being too soft. Really a great variation on the typical hamburger bun. The day before you want to serve: Place the beans in a pot and fill until the beans are under about 4 inches of water. The next day: drain the beans and pour them into the slow cooker. Add the remaining ingredients. Cook on low 8-10 hours or until the beans are soft**. I'd check in on it around the 7 to 8 hour mark if possible. If the beans are looking a little dry and are not quite done, add a little water. *I used the Original Mister Mustard Hot but any grainy, deli-style mustard would work. **Or up to 12 hours, they just get softer and more intensely flavored the longer they cook. I had never made baked beans before but I had heard that using the slow cooker was the way to go. I have to agree. The prep was extremely easy and by dinner time they were done. Added bonus: I didn't have to heat up the house making a side dish on a steamy Summer day. 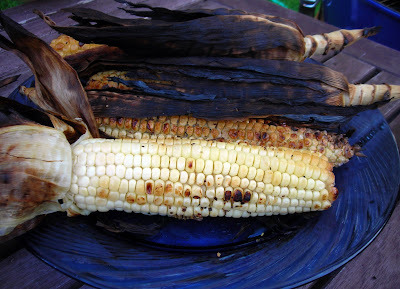 They were also very forgiving, they ended up cooking for almost 12 hours and were still the perfect texture and flavor, which would make them perfect for cook outs or parties-you make them early in the day and then they are ready whenever you are. I didn't want to make the typical Boston or New England style baked beans so I went for a more Caribbean/tropical influenced version that went well with the rest of the meal. 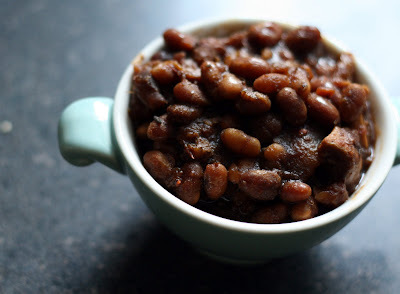 I ended up with beans that still had the texture and look of traditional baked beans but with a spicy, fruity edge. Having never made baked beans before, I was a little nervous but they turned out really well. I sort of approached them like I would pulled pork- lots of spices (but in small amounts because I knew the long cooking time would intensify the flavors) and just enough liquid to keep it from drying out. I don't like super sweet baked beans so I used just a bit of molasses and came up with the idea of using a mango for some natural sweetness. The mango ended up being the perfect addition, it totally "melted" into the beans and added a slightly sweet, almost citrusy flavor that was hard to put your finger on. No one guessed the "secret ingredient" was mango! Despite my deep and abiding love for pork products, I relied on spices and fruit for flavor, not meat, so these beans are a perfect example of an "accidentally" vegan side dish. Even people who didn't normally like baked beans liked these. Line a cutting board with a paper towel. Place the tofu slabs on the paper towel. Top with a second paper towel and cutting board. 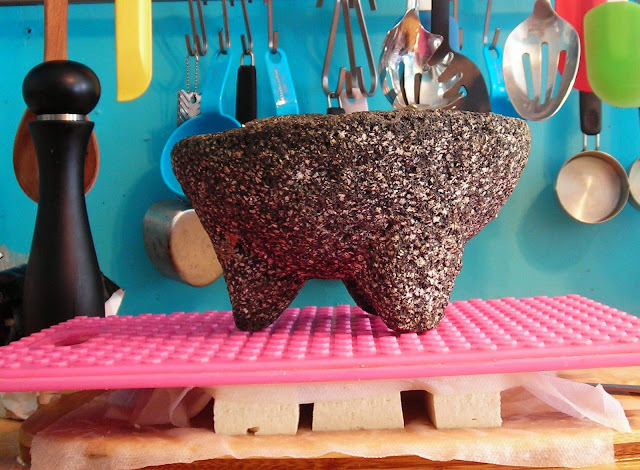 Place something heavy (like canned goods or a pot, I used our molcajete) on top of the second cutting board. Allow to press for 15 minutes, then cut each slab into 3 equal cubes. Pressing the tofu, while it seems sort of unnecessary, helps compact the tofu so it doesn't fall apart on the skewer and allows more of the marinade to penetrate. Place cubes in a resealable bag along with the marinade ingredients. Refrigerate for at least 1 hour, but up to 8. Meanwhile, remove the outer leaves of the lemongrass to reach the harder "core" and if whole, chop off the top and the bottom 4 inches or so. Cut one end into a point. Thread the tofu and the vegetables on the lemongrass. Brush with olive oil. Place on the hottest part of the grill and cook until warmed through, making sure each side cooks evenly. The tofu and vegetables should caramelize. Serve hot. Making lemongrass skewers was a time consuming operation, I have to admit. But! It was a worthy use of my time. They made excellent skewers which infused the tofu and vegetables with a wonderful flavor, completely destroying the myth that tofu is bland. You could make them on bambook skewers but you'd really be missing out. The lemongrass skewers really took the dish to a new level. 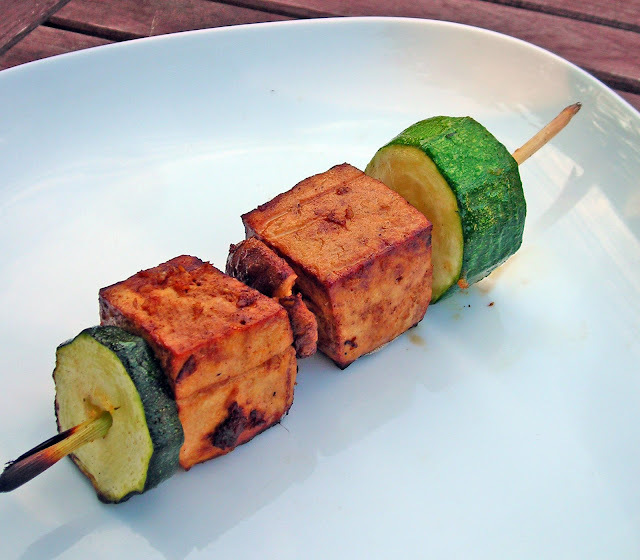 When you make this, take care that you place cubes of tofu and pieces of zucchini of roughly the same size together so they will cook evenly. 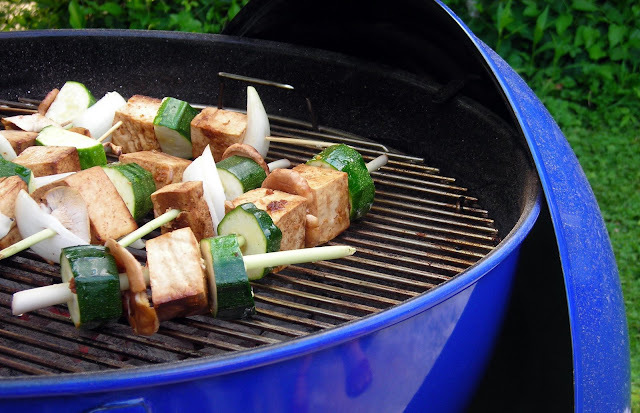 If you are having troubles cooking the zucchini thoroughly, cover the grill for a minute or two, it is difficult to overcook the tofu. In a large saucepan, saute the garlic, onion and carrot in olive oil until fragrant, about 5 minutes. Add ground beef and saute until brown, stirring to break up the meat. Add water, bourbon, tomato paste, and all of the spices. Simmer, stirring occasionally 20-30 minutes until thickened. Serve on buns and sprinkle with cheese. 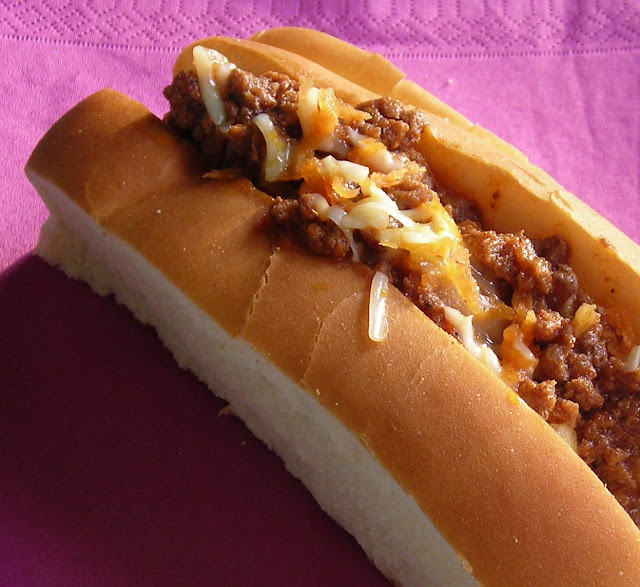 Note: While it is tasty on a sandwich, I also think it would be fabulous on a hot dog as an alternative to chili. There is something a little summery about sloppy joes. I guess because it is such a casual dish and Summer is all shorts and flip flops and outdoor dining. As I am over the age of 10, the canned and jarred sauce just doesn't cut it. I need more spice, and for this version, a bit of smoke. It still isn't a terribly glamorous dish but it is tasty, comforting and very satisfying. So, indulge! Have a sloppy joe night. And if you want to go all out, serve with some slightly grown up mac & cheese. In a medium saucepan bring the blueberries, water and sugar to a boil, stirring occasionally. 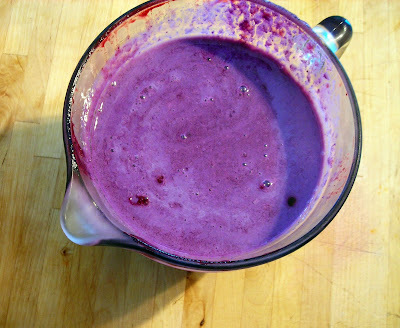 Reduce the heat and simmer until the blueberries are easily mashed and the sugar is fully dissolved. Mash with a potato masher until fairly smooth. You can either strain (really mashing the pulp with the back of spoon to get all of the guts out) or leave the skins in. Stir in the lime juice and zest. Allow to cool to room temperature then stir in the milk. Refrigerate overnight or until very cold then pour into a ice cream or gelato maker and churn as per the machine's directions. Store in an air-tight, freezer-safe container. Homemade gelato has a lot of things going for it. It is infinitely adaptable, lower in fat than ice cream, doesn't use eggs (no tempering or beating to a ribbon needed! 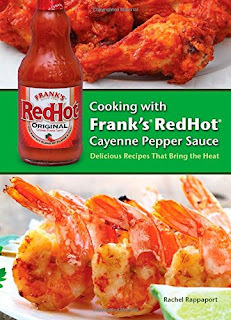 )and requires very little over-the-stove time, a major plus when living in a hot and humid place like Baltimore in July. 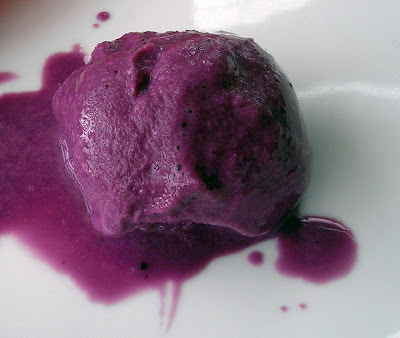 This particular gelato is especially fun to make, the color is dramatic (if a bit bilious in the pre-churned state) and the blueberry flavor remains true and fresh. I always feel a little guilty doing anything with blueberries (so expensive! so already perfect!) beyond simply popping them in my mouth. Gelato, like the blueberry-ginger ice box pie makes the most of their flavor with a minimal amount of fuss. Preheat oven to 350. Grease and flour or line 20 wells in a muffin tin. In a large bowl, mix together flour, baking soda and all of the spices. In a small bowl or large measuring cup, whisk together the eggs, oil, sugar, applesauce and vanilla. Pour into the dry mixture and mix thoroughly. Fold in the carrots, coconut and mango. Fill each well 3/4 of the way full and bake 20 minutes or until a toothpick inserted in the center of the center muffin comes out clean. Remove from pan and cool on a wire rack. 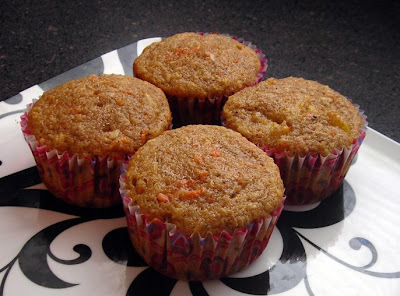 These are super moist and flavorful muffins. The combination of fruits, vegetables and spices might seem odd, but it totally works, I promise! These muffins also freeze well, we like to make a batch on the weekends and then freeze the rest in a single layer. They defrost really quickly once you take them out of the freezer without any change to the texture or flavor. 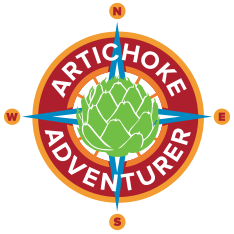 In a small bowl, use a fork and thoroughly mix together the yolks, mayonnaise, mustard, tarragon, chives, pepper, and capers. Spoon an equal amount into each of the egg halves. Sprinkle with extra chives, if desired. If you are a long time reader, you know that over the years I've posted more than a few recipes for deviled eggs. The second time I posted a recipe for deviled eggs I was apprehensive (how many variations on one dish can people be interested in?) but it soon became clear that there is a seemingly endless appetite for deviled egg recipes; every day dozens and dozens of people find this site expressly looking for deviled egg recipes and variations. Not to mention the e-mails I get asking for more deviled egg recipes when it has been a while since the last one. Who am I to disappoint? To me, the beauty of the deviled egg is its ease in preparation, endless variations (check out this cookbook if you don't believe me) and the fact that they are a real crowd pleaser. I can't remember a picnic or cookout I've attended that didn't have deviled eggs and rarely are there any left at the end of the day. For these particular deviled eggs the combination of tarrgaon, chives and capers add an elegant touch to the eggs without adding a lot of extra work. I just cut the herbs directly into the bowl using my kitchen shears and gave it a good mashing.